Get moving - for your mind, body and wellbeing! ﻿﻿﻿ ﻿﻿﻿﻿﻿﻿﻿﻿﻿﻿﻿﻿﻿﻿﻿﻿How’s your exercise regime going? An essential part of losing weight and keeping it off is regular exercise. And, your body was human body was made to move. But, according to the Australian Institute of Health and Welfare, most of us are not moving as much as we should. More than seven out of ten of us don’t exercise enough. Here are just some of the reasons that you should move more! You gain weight when you consume more calories than you use. Exercise is vital if you want to get lean and stay that way. But beware – unless your exercise is really intensive and you exercise for long enough, you may not be burning off as much as you think. For example, if you weigh around 60kg and you eat a 50g chocolate bar (270 calories) you’ll need to cycle at moderate pace for 35 minutes or walk for over an hour to burn it off! So, as well as burning off calories, thinking about what how much exercise you do and all those snacks and eats will help you to be more conscious about what you’re doing – and not be a distracted dieter! 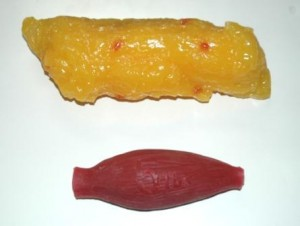 Muscle and fat are two entirely different tissues and you can’t replace one with the other. But you can build muscle and reduce body fat with weight training and strengthening exercises. Muscle burns more calories than fat because it is metabolically active i.e. it needs more fuel to exist rather than fat which is a storage material. Your body uses up fat stores when you exercise and build muscle. And, more muscle means more calories burned daily. So, for every half a kilo of muscle you put on, you’ll automatically burn an extra 22 to 36 calories daily and you’ll have a sleeker, more shapelier shape. Muscle and fat take up a different amount of space in your body, too. Take a look at 2.5kg of fat and 2.5kg muscle – when you have more fat, you can see clearly why you’ll have more wobbly bits! You can target your problem areas – fat from around the exercising muscle is used for energy so you can firm up trouble areas. So if it’s your tummy that’s causing trouble, learn exercises that target your core. Aim for strengthening exercises like weights at least twice per week for up to 30 minutes to slowly build up your body’s muscle. Oh and if you’re a woman, don’t worry that you’ll get too muscular by weight training – women don’t have enough testosterone to build as much muscle as men. 6. Feel good about yourself! According to the Black Dog Institute: ‘Numerous studies have shown that people who exercise regularly experience fewer symptoms of depression and anxiety than those who do not exercise regularly’. Also, ‘Several trials have shown that regular exercise of moderate intensity can be an effective treatment by itself for mild-to-moderate depression.’ That’s because exercise boosts the release of endorphins, the body's natural painkillers and feel-good chemicals which in turn helps to boost your mood . And as regular exercise helps to tone and shape your body, you’ll have more reasons to feel good about yourself! Include three sessions of strength training. The ultimate in sculpting your body, this flab fighter builds muscle and burns fat so you have a sculpted, leaner look. Plus, the more muscle you have, the faster your metabolism – i.e. the faster you burn calories.